Plasma Process for the Model PB3 & Plasma Matrix Series Systems : Manitou Systems Inc. This page includes a description of various plasma processes that may be performed using the Series PB3, Delta Glow & Plasma Matrix plasma systems. Soda lime glass cleaning – A plasma process may be used to clean the glass surface prior to the fabrication of CdS/CdTe and CIGS thin film solar cells. Substrate coupons are typically 1″ x 1″ x 1 or 4 mm thick for this application. The fabrication of high efficiency photovoltaic devices requires that the surface is extremely clean and free of contaminants, i.e., dust and grease. Before loading into the plasma system, the glass is pre-cleaned using acetone and isopropanol solvents. 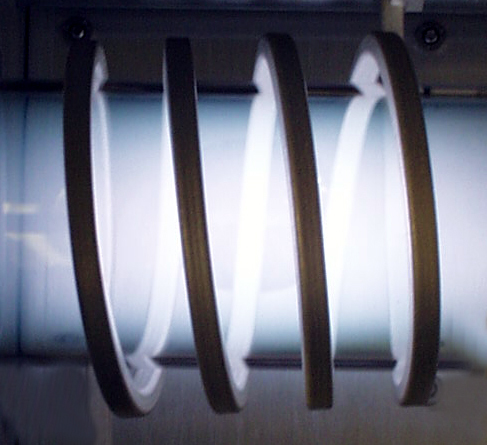 The coupons are fixture vertically inside of the process chamber to effectively clean both sides simultaneously. The plasma process will remove residual organic material by bombarding the surface with ionized ambient air gas molecules. The Plasma Matrix system is operated at approximately 100 watts of 13.56mHz RF power for a period of 10 minutes to perform this process. The measured DC electrode bias is approximately 400 volts with a pressure of 4.7×10-1 mbar. The coupon(s) can now move on to the thin film deposition step.